How the heck would you plan a story like this? 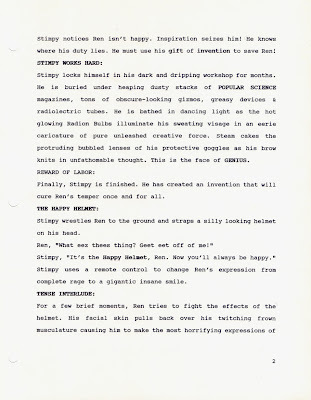 In this outline you can see the whole structure of the story. 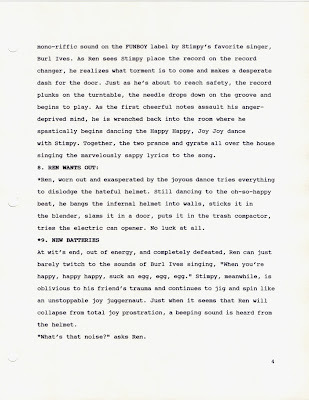 The way the outline is formatted is designed to help you easily follow the story and the main events in the structure. Not only the structure of the overall story, but the sub structures within. Each of those major sequences has its own hierarchy of scenes happening that define the larger purpose of the sequence. Each scene that describes the sequence in turn has gags and events that define the purpose of the scene. 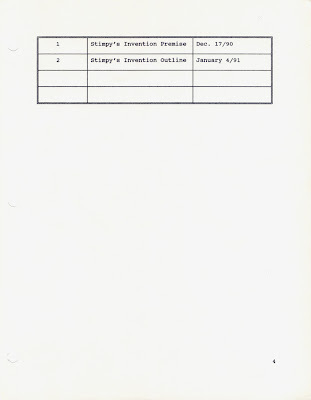 The headings that are numbered with a number and dot "- 1." are the main sequences. Each main sequence has a number and a title heading that describes quickly what the scene is about. 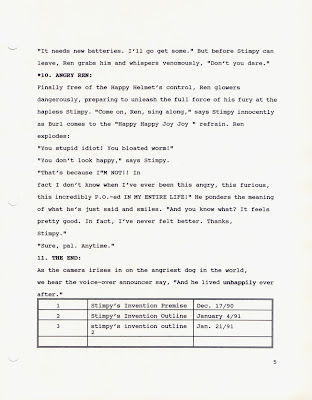 You can read all the numbered headings without the text underneath and follow the structure of the story. Having headings for everything is really handy. It lets you see at a glance where every main point in your story is headed and how it fits into the larger picture. A script doesn't do that. You can't see the structure of a script at a glance (if it even has one!) It is unwieldy and hard to follow and can easily meander off course by getting lost in random details. Scripts are a chore to read and really hard to work from. Some of the sequence headings in an outline have more than one scene each helping define and adding details to the sequence. Each scene has its own heading. 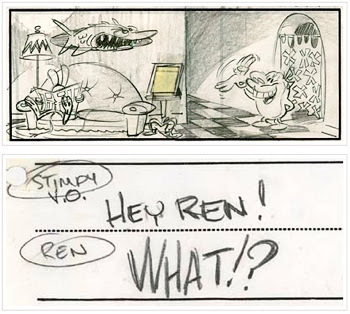 All 3 of those scenes help describe the idea of Ren doing nice things. Under each scene heading is a simple description of what happens in the scene. 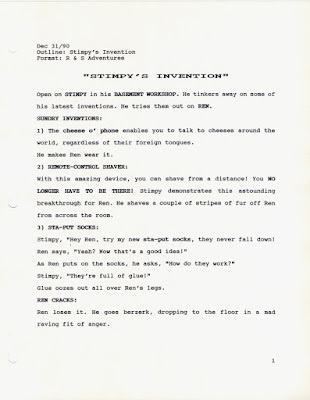 After Stimpy's Invention I discovered that it's easier to read an outline in list form rather than in paragraphs. One point at a time. In this cartoon, I raced through the end, rather than to have a slow wind-down like most filmed stories do. I figured that I wanted to pack as much pure entertainment into the cartoon and not waste time with formula structure that usually includes formula filler. Why do movies and TV have filler? Because everyone in Hollywood is so used to seeing it in other movies and TV shows that they automatically assume it is needed. They even write books about it. We absorb bad Hollywood habits into our system, unless we constantly question every rule to see if it has any real basis in pleasure. Over time, without radical sceptics to shake things up and ask why there are formula ways of thinking, the bad habits build up and get larger and more prevalent until they become the sole elements of a story. Filler movies. 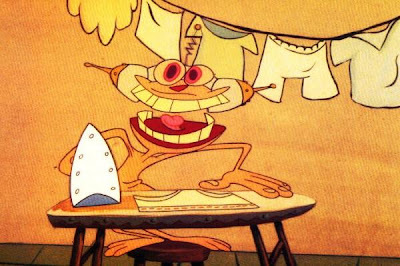 I figured Stimpy's Invention was over after the song; there was a big climax with Ren exploding so let's just STOP and leave everyone with their mouths hangin' open. I didn't want the audience to settle down to calmness. I wanted them to crave more. I eliminated the filler. Jackie Gleason did that too in the Honeymooners. He tagged his pathos onto the end of his shows but got it over with quick. He just put it there so the women in the audience wouldn't hate Ralph for being such a bully. Happy endings should be fast. Here's another version of the outline. We always have to do a million nitpicky changes in every TV or movie story to make the execs feel like they have a reason to exist. Actually, the one exec that was really great was Vanessa Coffey. The rest of her team wanted to kill this cartoon, but I begged her to trust me and she did. The rest of the band of no-goods were so mad! Until the cartoon aired and was a hit. Then they all took credit for it and asked me to make more just like it and to stop coming up with new ideas. 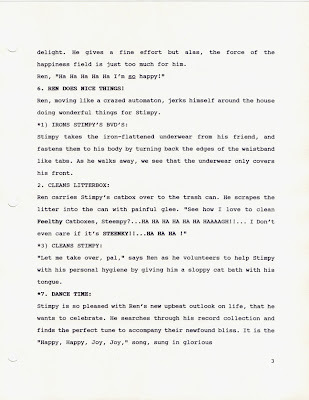 Note that every story detail and gag of the cartoon isn't in the outline. That's left to the director and the storyboard artist. 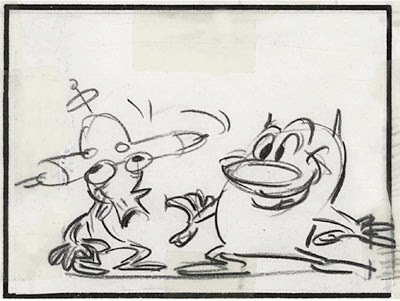 The storyboard artist will use this idea of hierarchical gag structure as well. 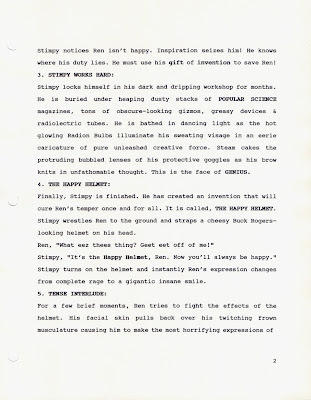 All his details, and dialogue must help define the scenes, characters and sequences in the structure of the story. He can't just veer off on tangents that have nothing to do with the structure. In my cartoons, every detail helps define some larger point which in turn defines an even larger one. It's like a studio system. Leon Schlesinger is the boss. He has 3 teams that work under him. Each team has a boss or director. Each director has 6 animators who answer to the director. Each animator has an assistant. The assisted animation has to be inked and painted. The painter follows the assistant animation that follows the animator who answers to the director who answers to Leon who answers to the audience. The people underneath have to follow what the person next up on the ladder commands. Everyone can't just go off and be creative on their own and draw whatever they want. That would be anarchy. Stories are like that too. 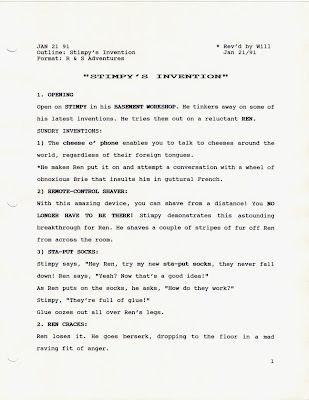 Every detail answers to a larger point or gag which describes the point of a scene which describes the sequence which fits in an order in the overall story. Hierarchy is better than anarchy. Everything wraps around something larger. The word "composition" applies to both art and story....and to music. It's the control of the rest of the creative elements. All this should apply to shorts, half hour shows and feature films. There is no need for filler if you are an artist with lots of interesting and fun ideas and understand what makes characters fun to watch. Now when you go to an animated feature, there are a hundred characters, none of which have a shred of real personality who act and move like every other animated feature character. This crowd of fake characters travels in a pack from place to place and learns to share and cooperate. There's a fake death scene to milk the pathos, heterosexual love interest between blank characters with no personality, a contrived complication that keeps the lovers in an obvious misunderstanding, non-melodic songs about hetero love by gay bands,... and on and on into endless formula and filler while you writhe in your seat waiting for something fresh and interesting to happen. Wanna be an assistant? Wanna be an assistant? Wally Walrus VS UPA part 1. Soupy Sales - Pookie sings "I'd like to know"